If you’re looking to replace your current Air Conditioning unit, it can get overwhelming with a number of options out there. Do you get a super small one that doesn’t take up much room and can be hidden? Or do you get the biggest of the big boys, hoping its size means it’s more efficient? Surprisingly, neither is the right choice. That’s because AC units aren’t one size fits all. And choosing the wrong one can cause your energy prices to skyrocket, along with the temperature on your thermostat. 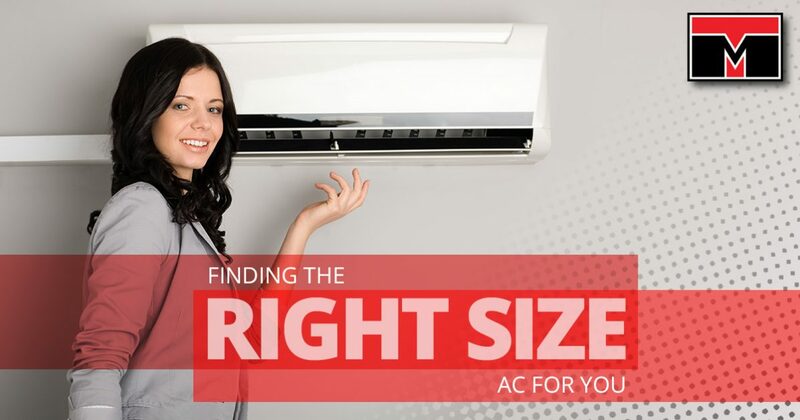 We’re going to dive into some info about what the wrong size AC can cause, along with helpful tips for how to find the perfect Air Conditioner for you. I know what you’re thinking. Just get the smallest one possible, that way it’s not taking as much power, right? Wrong. Because of its small stature, you’ll need to run this AC unit constantly to maintain the temperature you want. Even if you do that, it’s going to be working incredibly hard to cool the entirety of the house, and that’s not guaranteed to be possible. This means a constant drain on power increasing your energy bills, and the continuous usage means repairs are needed more often and the lifespan of the Air Conditioner will be severely reduced. Just remember, small size doesn’t equal smaller bill. So if a small Air Conditioner isn’t the way to go, clearly bigger is better? Sadly no. Many people have gone with the biggest AC unit they could find, thinking that it’s larger size means it’ll get its job done with less work. What ends up happening is the Air Conditioner will run until it gets the temperature down to the level you set it at. Once it’s done that, the unit will shut down. This allows the temperature to creep back up higher and higher until the unit turns back on and starts the cycle again. The consistent startup-shutdown cycle increases the amount of power used to operate throughout the day, negating the savings you thought it would bring about. It ends up resulting in a higher than average energy bill every month. Though that is one way to describe it, a more accurate description is an AC unit that is fitted for your home. How do you get one that fits properly? We recommend gathering some info prior to going shopping for your new Air Conditioner. We know that list can seem daunting, but doing a little bit of homework will end up saving you money and headaches in the long run. There are ways to calculate the best Air Conditioner for your home, but when you’re not well versed in this area it can be easy to make a mistake and end up with something far too big or small for your space. We recommend speaking to one of our professional HVAC technicians to take the guesswork out of the situation and ensure you get the exact unit that suits your wants and needs. Tippetts Mechanical is your go-to source for HVAC expertise in Las Vegas. We know how hot it gets here, and we want to help you and your family stay cool and comfortable. Give us a call today!